A Smart Notes Email to Word conversion Solution for Documents Retention! Documents management is a very important and crucial activity any of the organization. A research study conducted recently shows that 95% for the critical documents are stored on emails. The corruption of email data files is same as any other file so it is always advisable to keep a backup of your important documents of your organization. Why Document Retention? If your organization is using Lotus Notes email client and you are thinking of creating a backup copy of your important documents in MS Word format. There are certain compliance and legal requirements to where any organization needs to keep their contact related documents for 30 years. It is not possible to keeps the email documents on Lotus Notes for such a long amount of time. Lotus Notes Email to Word Conversion Process: The process of exporting the data from Lotus Notes to Word format is full of complexities, because any manual conversion process cannot grantee upon the integrity of data. 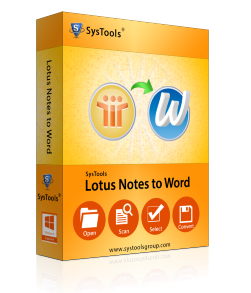 Now you can use Lotus Notes to Word Converter software which uses the automated process and converts Lotus NSF to Word just in few clicks. Using this expert tool you can convert all the important email documentation in MS Word format. After the conversion process you can store your word documents on any documents management software so you can easily retain all the required documents whenever there is need to retain them. Make your Decision and Get the Smart Solution: So without searching any more Lotus Notes email to Word conversion solution to perform this task you can use our Lotus Notes word converter software demo version which will allow you convert first 10 Lotus Notes Emails to Word free of cost. If you are satisfied with the results of our Lotus Notes to Word conversion then you can buy the full version which will allow you to convert unlimited Lotus Notes emails to word document format. So do not squander your time here where, because your time is important for you. Without wasting your time you can try our Demo version of Lotus Notes to Word Converter for transfer first 10 Emails for free of charge.